The Help Module is an article based guide which helps you in learning how to use CellSmart POS. 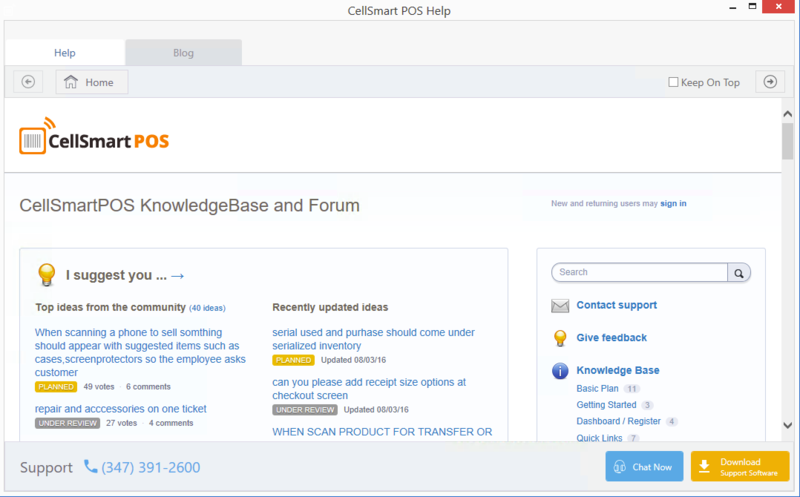 In addition to articles, you also have the option to contact customer support, visit the CellSmart POS Blog, provide your suggestions, give feedback, download support software or chat with one of our support reps for assistance. Information such as starting up the software all the way up to making sales is provided with-in the help module. The articles are categorized topic wise and some are written in how-to style. They are written and categorized according to CellSmart POS's format and provide you with the general steps and necessary information to use software. Different tabs in the software consist of their own topic listed in the help module. For example, the New tab, list tab, Inventory and other tabs in the software have their own topic which allows you to easily access a help article based on the software's format. From the software, click on the Help button located at the top right corner. From the help module, scroll down to view each topic and its articles OR type in the keyword in the search field related to your topic and the search will provide you with the related articles. For example, if you wish to search for how to create a repair, you may type in repair in the search field and the articles closely related to repair will be presented. Note: When lost, click on the Home button on top to return to the home page. From the help module, click on the Chat now button located at the bottom right corner of the software. Your browser will open up and lead you to the CellSmart POS chat window, which will ask you for your CSP ID. Your CSP ID is located at the top left corner of the software. Ex: CSP1234. Enter your CSP ID in the chat window and press enter to send your ID. From there on, our support team will be happy to assist you. From the help module, click on the download support software button located at the bottom right corner of the software. From the help module, click on the post a new idea link listed under the suggestion box. Enter the title of your suggestion in the I Suggest you field. Enter the suggestion details in the description box. Select the number of votes. Enter your email address in the field. Click on the Post Idea button to post your new idea! From the help module, click on the Give feedback link. Enter the title of your feedback in the I Suggest you field. Enter the feedback details in the description box. From the help module, click on the Blog tab next to the home tab. Scroll down to view different blogs.